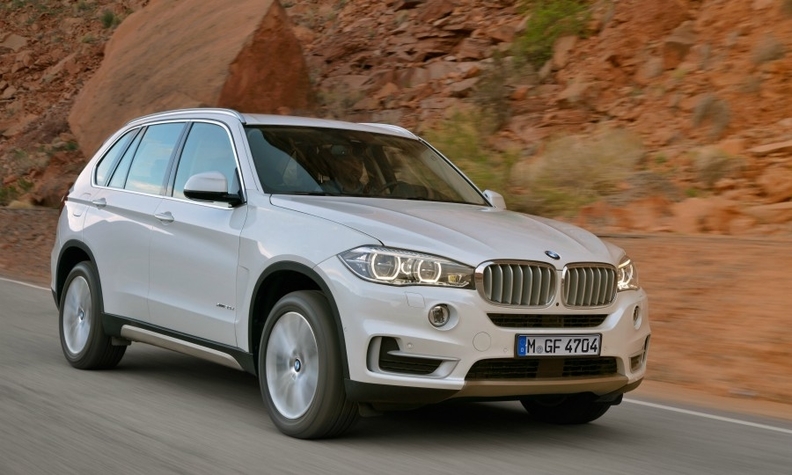 Diesels such as X5 xDrive30d (shown) account for three-quarters of BMW's European sales. Almost 30 years ago Volkswagen advertisements introduced the term Fahrvergnuegen, German for driving enjoyment. Because of its cheating on diesel-emissions tests, VW has unwittingly helped to introduce a new, less flattering term into the world’s vocabulary: Fahrverbote (driving bans). Driving bans loom in Europe as governments in Germany, France and the UK crack down on toxic nitrogen oxide emissions from diesels, leaving brands such as VW, Mercedes-Benz and Volvo at risk because they have bet heavily on the powertrain to meet tougher CO2 emissions rules that start to take effect in 2020. The growing anti-diesel sentiment will make it harder for automakers to meet the EU's fleet CO2 target of 95 grams per kilometer. Diesels are about 20 percent more fuel efficient than gasoline engines so they are key to most manufacturers' CO2-reduction strategies. Automakers that miss their CO2 targets face stiff fines. Demand for diesels, which held steady in the immediate aftermath of VW's scandal, is starting to crumble because of intensifying pressure on the powertrain, especially in Germany. Stuttgart, the cradle of Germany’s auto industry, could even prevent 3-year-old diesels from entering the city limits on certain days starting next year. Munich will likely be the next to institute a ban following a court order at the end of February. The bad news had a quick effect: diesels accounted for just 40 percent of Germany's new-car sales in March, compared with 45.8 percent last year and a high of 48.1 percent in 2012. "It was a catastrophe," a senior German industry official said about the steep decline in March. "The first thing we need to do is get away from this debate over Fahrverbote." The official added that any solution to retroactively clean up Euro 5 diesels won't be found until after Germany's national election in September. 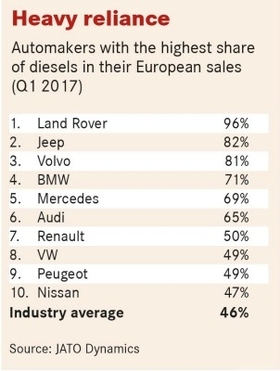 In Europe, the diesel share fell to 46 percent in the first three months of this year from 50 percent during the first quarter of 2016, according to data from JATO Dynamics, as other governments joined Germany in cracking down on the powertrain. For example, London's mayor said in mid-February that owners of pre-Euro 4 diesels will face an extra 10-pound "toxicity charge" when entering the city center starting in October. BMW has the highest share of diesels in Europe among German luxury brands at 71 percent, according to JATO. More than 80 percent of Volvo's cars are oil burners and Land Rover barely sells any gasoline-powered cars in Europe. Experts say, however, that the diesel-heavy premium brands have less to worry about due to their high levels of fleet sales. Many fleet customers, who drive their corporate cars for two to three years before returning them, will only shift away if the residual values of used diesels dip to the point where it puts upward pressure on leasing rates. The experts say that manufacturers that sell diesels to private buyers, who on average keep the vehicles for 10 years, are most at risk because their customers will think long and hard before committing to a diesel. One brand that could face this pressure is Peugeot, which counted on diesels for nearly half of its sales during the first three months of this year. That was higher than any of Volkswagen Group's volume brands. What's sadly ironic is that not only does Peugeot have the lowest measured CO2 emissions of any automaker competing in Europe, it is also one of the only brands to use the most expensive NOx reduction-technology, SCR urea treatment with AdBlue, across its entire diesel lineup. That means it could become an innocent victim of the backlash against diesels as customers shift to gasoline engines to avoid the risk of not being able to drive into Europe's biggest cities. Tobias Ulbrich, a specialist in transport law with the German firm Roger & Ulbrich in Dusseldorf, has little sympathy for carmakers, arguing they have brought the bans upon themselves with their scandalous behavior. He is defending some 1,700 Volkswagen owners in Germany suing the company for damages, claiming used car buyers who considered purchasing a VW diesel from his clients lost interest when they discovered the car was affected by the recall. Ulbrich said the driving bans are the result of automakers' failure to meet NOx limits. "In an environment where bans are an immediate threat," he said, "those people that regularly drive in the major metropolitan areas are not going to purchase a diesel under any circumstance -- no matter how clean manufacturers claim these cars allegedly are."